This entry was posted in Events and tagged women's philanthropy board, wpb on April 6, 2011 by Wire Eagle. AUBURN – A leading figure in the publishing industry will be the keynote speaker at the ninth annual Women’s Philanthropy Board Spring Symposium on Monday, April 11, at The Hotel at Auburn University and Dixon Conference Center. Phyllis Hoffman DePiano, president and CEO of Hoffman Media Inc., has made a name for herself as a savvy businesswoman and entrepreneur. Hoffman’s company produces a number of magazines that define and celebrate Southern women’s lifestyles. “Sandra Lee Semi-Homemade” and “Phyllis Hoffman Celebrate” are her newest products. June Henton, dean of the College of Human Sciences, called the Birmingham-based Hoffman “a state gem” for her successes as a female executive. This entry was posted in Alumni, Campus Announcement, Events and tagged lecture on April 6, 2011 by Wire Eagle. AUBURN – Bobby McAlpine, an Auburn University alumnus who is internationally recognized for his work in architecture and interior design, will be the featured speaker for the 2011 Grisham/Trentham Lecture Series on Thursday, April 7, at 11 a.m. in the auditorium of The Hotel at Auburn University and Dixon Conference Center. McAlpine, a native of the Monroe County community of Vredenburgh in southwest Alabama, graduated from Auburn’s College of Architecture, Design and Construction, and founded the architectural firm of McAlpine Tankersley in Montgomery. He also established the design firm of McAlpine Booth and Ferrier Interiors and McAlpine Home, a handcrafted furniture company. His visit to Auburn, however, will focus on the world of interior design. This entry was posted in Campus Announcement, Events and tagged new horizons on April 6, 2011 by Wire Eagle. 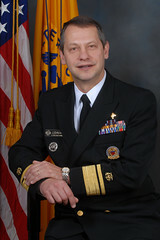 AUBURN – Deputy Surgeon General Boris Lushniak, a Rear Admiral in the U.S. Public Health Service, will give the Auburn University Graduate School’s 2011 New Horizons lecture titled “Public Health Priorities of the United States Surgeon General”, Friday, April 8, at 3 p.m. in the Shelby Center auditorium. A reception will follow in the Shelby Center atrium. Lushniak began his career with the Public Health Service in 1988 as part of the Centers for Disease Control and Prevention’s epidemic intelligence service. During his 16 years with the CDC, his focus on occupational hazards led him to establish an occupational skin disease program at the CDC’s National Institute for Occupational Safety and Health. He has served on disaster response teams in Bangladesh, St. Croix, Russia and Kosovo and at the World Trade Center in 2001. In 2004, Lushniak joined the FDA as chief medical officer of the Office of Counterterrorism and was appointed assistant commissioner in 2005. This entry was posted in Campus Announcement, Students and tagged phi beta kappa on April 6, 2011 by Wire Eagle. AUBURN – This year marks the 10th anniversary of Auburn University’s chapter of the Phi Beta Kappa Society. Founded in 1776 at the College of William and Mary, Phi Beta Kappa is the oldest honor society in the nation and universally recognized as the most prestigious. After four decades of work by members of both the Auburn faculty and the community who had been initiated at universities around the country, Phi Beta Kappa approved the installation of a chapter at Auburn in 2001. Phi Beta Kappa recognizes academic excellence in the liberal arts and sciences, focusing on studies in the humanities, social sciences and natural sciences, including mathematics. The society’s founding members challenged the non-intellectual emphasis of earlier university student groups and promoted the serious seeking of higher education fostered by freedom of inquiry and expression – all in the pursuit of wisdom. This entry was posted in Campus Announcement, Faculty on March 23, 2011 by Wire Eagle. AUBURN – Auburn University Provost and Vice President for Academic Affairs Mary Ellen Mazey has been named president of Bowling Green State University in Bowling Green, Ohio, effective July 1. The Bowling Green Board of Trustees voted Tuesday to select her for the post. “As a leader, it’s not too difficult to make a positive impact when you have a healthy budget. It’s a lot harder when funds are short, but that’s exactly what Mary Ellen did,” Auburn President Jay Gogue said.